A closet isn’t any good unless it’s filled. Filling one with running shoes is often inevitable for passionate runners. Luckily there’s more than not being able to find the floor to owning multiple pairs of shoes dedicated to running. Here are three of Team ECRP‘s top reasons to keep several worthy pairs at your disposal. Different purposes. The biggest reason you’ll want to have more than one pair of running shoes is that they don’t all perform the same job. Some are built for racing on the track and others for the trail. There are light shoes for racing and cushy ones for recovery. Most runners train on a variety of surfaces and paces so it’s important to be prepared with the right gear for your workout. Have a pair of dedicated shoes for each environment you’ll be tackling. Models Change. Constantly and not always for the better, in fact. With shoe companies competing and technology changing there is always something different on the market. Your current favorite shoe might not exist the next time you want t buy it and that can be disappointing. Yes, you can grab 20 pairs of what you like each time you hit the store but they’ll wear out too. Owning a variety of brands and models can protect you from that disappointment. They age. Just like everything else shoes get old and wear out. 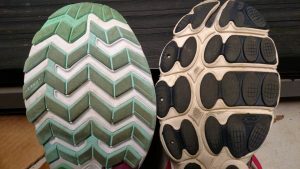 Soles wear down and stop providing traction while insoles break down and can’t give support. Old shoes are a recipe for injury and pain and throwing on a fresher pair can really open your eyes to needing some new ones. You can check out this post to see if your current pair needs to be replaced. While there are lots of other good reasons to add more running shoes to your collection these are the most important ones. Having a choice model is every color? That’s just a bonus. 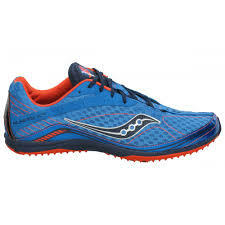 This entry was posted in Racing, Running and tagged racing shoes, running, running gear, running shoes, trail shoes on March 26, 2018 by Coach Meredith. Running a marathon is hard. Racing one is even harder. No matter how fast you cross the finish line your body will hurt, your mind will be tired and emotions will still be running high. After your collect that medal and celebrate with all the carbs of any kind, it’s time to start letting your body heal. How fast and how well you treat your beat up muscles post race makes a huge difference in how quickly you can get back to your regular routine. Use these tips for high quality marathon recovery and you’ll be back on track in no time. Keep moving. One of the most important aspects of marathon recovery is movement. This doesn’t mean a tough track workout two days later or taking off for another race. Giving muscles some easy work to do the day after racing has been shown to speed recovery but it has to be just that, easy. A slow jog, air squats, a few push-ups and 30 minutes of yoga works wonders. Your goal should be to keep blood, nutrition and oxygen pumping to damaged muscles without any added stress. Mobilize. Just getting out there are easy jogging a mile or two won’t get the job done. You need to work tired and abused joints through a full range of motion to keep fluids moving around. This is how you make sure muscles, tendons, ligaments and bones get the blood, oxygen and nutrients they need to repair while clearing out the debris from when they got damaged. Foam rollers, bands, softballs and a lacrosse ball are all part of a well built marathon recovery kit. A professional sports massage is also always a good idea. Eat up. You definitely burned a ton of calories covering all of those miles. Replacing them and giving your body the nutrients it needs to repair damaged muscles is paramount. Replenish fluids with sports drinks or salted water as soon as you cross the finish line. When your tummy is ready, chow down on calorie loaded foods like bananas and yogurt. After chilling out, putting your feet up for a bit and processing those foods, it’s time to head for pizza and tacos. Sleep. Getting an adequate amount of sleep will help you recover faster than just about anything else. After the excitement of finishing and celebrating it can be tough to shut down. When you get home try taking a warm bath, meditating and turning off all electronic devices. Here’s a great piece on how a solid night’s shut eye can make a big difference in your marathon recovery. Go easy on the celebration. Yes, those free beers taste delicious but they’re just going to cause more trouble for your already hostile body. Dehydrated muscles aren’t aching to lose more water. Drink a bottle of water or sports drink before anything alcoholic then make sure you mix in plenty of other fluids with those post race cocktails. 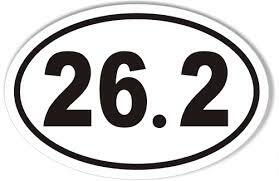 A long walk or standing around for a little bit won’t do any harm but staying for the entire post race convert might. You want to get off your feet for a few hours as soon as you can to start the healing process. Freeze. Cryotherapy and ice baths are wonderful tools to jump start marathon recovery. Part of many runners’ regular plan cold therapies are effective and simple. Lowering your temperature flushes waste from muscles, reducing swelling and lets them get down to business right away. Have an ocean or lake near by? Celebrate by jumping in! This entry was posted in Racing, Running and tagged marathon, racing, recovery, running on March 5, 2018 by Coach Meredith.